TROUP COUNTY, Ga. — A brush fire in Hogansville is officially contained, but far from out according to the Hogansville Police Department. What began as a small brush fire off Lincoln Street Sunday night had Troup County fire crews contemplating possible evacuations after it quickly grew. Now, officials said a state forestry plane is expected to do a flyover early Monday morning to guide tractors needing to cut a larger fire swath. If that doesn't help alleviate fire conditions, officials said a firefighting chopper may be brought in to fight the flames using water from the city reservoir. 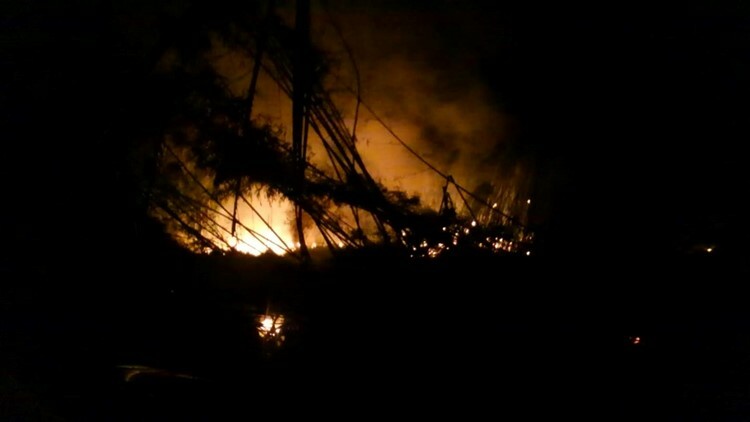 Firefighters had been working with the Georgia Department of Forestry to cut a swath around the fire to try and contain it, but around 10 p.m., officials said the fire jumped the trench and was initially "burning out of control." "Forestry workers cannot get their tractors into the affected area due to a large ravine and are currently assessing whether to bring in a firefighting helicopter or aircraft," police said in a Facebook post. In an update, however, city officials said the fire now appears to be contained, but is being largely fueled by bamboo, which is "popping like gunfire." At this time, city officials are asking the public to keep away from the Lincoln Street area. While they were initially eyeing an evacuation order to potentially threatened structures, city officials say they no longer believe that will be needed.